Online marketplaces are being created for just about anything you can think of. Some have a local services component on one side of the marketplace that carries an extra burden that other marketplaces don’t have. Such marketplaces can’t immediately gain broad geographic coverage for their offering. Examples, include transportation network companies (ie – Uber, Lyft), food delivery services (ie – GrubHub, Postmates), in-home cooking services, on demand photography services and many other types of services that aren’t easily on-boarded into the marketplace and activated without some local presence by the marketplace company itself. This phenomenon creates an extra burden when trying to scale after initial business model validation and that, in turn, creates an extra burden when trying to convince investors to put their money into the company. If you have such a company, read on because in this article I describe some key things to consider and possible approaches to take when devising your market expansion plan. Just because a local services component is involved on one side of the marketplace doesn’t mean you also need a local presence in order to enter each new market. So your first step is to figure that out. Using the list below, assess how possible each activity is to accomplish without a local representative in each geographic market (which is usually a city or major metropolitan area). The assumption here is that the service provider represents the supply side of your marketplace (versus the demand side). I guess it is possible that other aspects of the customer (demand side) lifecycle requires your local representation but that’s not usually the case for the dilemma I’m addressing. Can you build the product to perform the desired function(s)? Can you efficiently get both the supply side and demand side on-boarded onto the platform? Are transactions or other usage occurring in the manner expected (ie – quantity, frequency, duration, etc)? Which side of the marketplace (maybe both) should be charged and how much are they willing to pay? What level of support is required for each side of the marketplace? The list could continue through just about every aspect of your business plan and you can use a Business Model Canvas for guidance. The more you’re able to fully validate in your home market the better. But if you’re the type of marketplace company I’m referring to in this article, there will definitely be things you won’t be able to fully validate in your home market. Using that list of things, let’s move to the next step. Entering your second market will be one of the biggest risks you take because the stakes are really high. With success you could/should be able to unlock additional funding to continue your journey. But screw it up and you might not survive long enough to get a second chance. There is a critical trade-off when selecting your second market. You want it to be “easy” enough and low risk enough to have high odds of success. But, on the other hand, you want to make sure it is representative enough of your continued market expansion plan to gain the needed validation. In other words, if it’s too easy and not representative of future expansion, you won’t get sufficient credit from investors and that puts your additional expansion funding at risk. One thing I commonly recommend is finding a second market that has important attributes of what you communicate in your business plan as a “target market” but is close enough geographically for the founders and first employees to have reasonable access, if/when needed. For example, if your home market has a small or spread out population and your solution is optimized for larger cities with downtown density or some form of population concentration, seek such a city that is a 3-4 hour drive away. You will be able to validate things in a more ideal market and can be there in person with a somewhat reasonable delay for inevitable emergencies or scheduled validation trips and with minimal cost. If you pick a city that is only 60-90 minutes away, it will seem too much like a geographic extension of your home market. But if, on the other hand, you pick one that is a plane flight away, you can’t be very responsive to emergencies and your costs for scheduled validation trips will be high. How many people are needed – full time, part time? What skills or experience levels are needed? How do you measure their success? What support do they need from the HQ operation? With reasonable success and additional validation in this second market, congratulations – you get to keep playing the game! After you launched in your home market, you collected (hopefully) various financial and operational metrics and trended them over time through various experiments to gauge progress and identify what’s working and what’s not. That’s great. But the issue is that until you enter your second market you don’t have anything to compare your results to. Maybe you were lucky. Maybe there wasn’t any true competition in your local market. Or maybe your success was due to the fact that your whole team lives and works in the same market (market knowledge, responsiveness to issues and opportunities). The full expectation from investors is that your second market will be considerably (maybe significantly) better in this context. That’s because your product, processes and tools are more mature. Basically, you figured a bunch of things out to the point where you were ready to enter your second market. So the results and trend lines for it should easily surpass your home market. Think about this ahead of time and be ready to directly compare your second market to your home market from the moment you enter it. Use various metrics that you believe best demonstrate the health and viability of the business. Usage, transaction volumes, and both supply and demand side participation metrics are likely to be included. Those are pretty straight forward. Two additional metrics that you might not be thinking about but should be given consideration are covered in the next section. 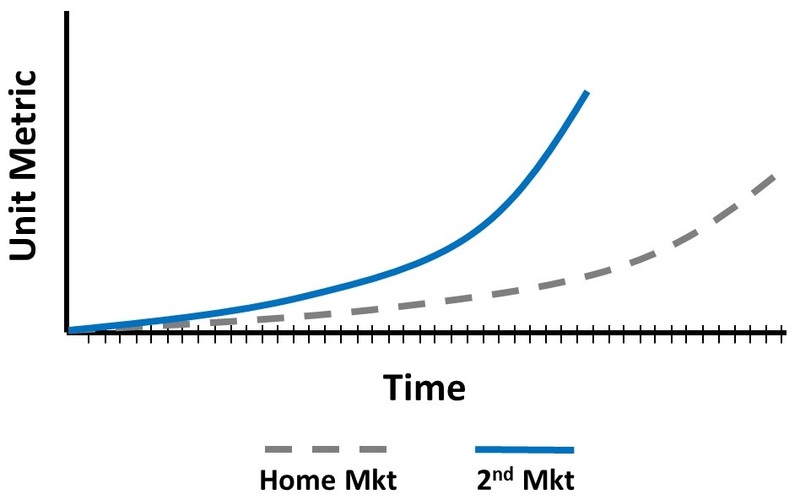 The slope of any trend curve for the second market should be more positive, allowing you to reach various milestones in half of the time as compared to your home market, for example. Think of this just like a cohort analysis with each geographic market being a cohort. Many startups are taught to calculate their average customer acquisition cost (CAC). In the case of marketplaces that have a geographic expansion strategy, I often recommend putting more emphasis on evaluating the market activation cost (let’s call it MAC). In fact, CAC might not even make sense for your marketplace business. What is market activation cost? Essentially, it’s how much it costs to open up a new market to the point of getting the first transaction. In fact, you might have a different MAC for different types of markets. For example, major metropolitan areas versus mid-market cities. If your expected MAC is reasonably different for various types of markets, measure them separately. After reaching your first transaction in a new market, you will be seeking various additional performance milestones. One of the most important milestone to predict, measure and optimize is the time it takes to reach breakeven after that first transaction. This is the same basic concept of calculating CAC Payback for SaaS companies. To my way of thinking, the TTB is reached when the net revenue or gross margin in a market (in other words, not gross merchandise value or GMV) is equal to or greater than the identifiable and discreet operating costs for that market. Allocated expenses from headquarters – Notice that I said “for that market”, which means direct expenses uniquely attributable to that market. Some investors might prefer to see some or all of the expenses from the HQ operation allocated (spread) to each market. Without that, you could have each market exactly at breakeven the way I described it above but while still losing money at a company level due to the HQ expenses. My issue with trying to allocate HQ expenses for an early stage company is that too many assumptions and adjustments are needed over time to make this sort of allocation method work. Save that for when you’re at $5-10M in annual revenue and with most of your critical markets already launched. With success in the next market(s) and subsequent funding, each additional market should get less and less risky. Make sure to leverage what you learn from your second market to pick the best third, fourth, etc. markets while introducing any yet-to-be tested elements of your business plan for continued validation. For example, the moment you enter a market that can’t be reached easily by the founders you will be fully dependent on your local reps to do their job. Their only “life line” is phone and email. Additionally, my comments above about metrics and trends continues to be critical through your next several new markets. You need to show that you’re getting better and better at new market entry, activation and optimization. That success will be a cornerstone of your future fundraising efforts. Your graph should look something like the one below and you will likely have multiple graphs – one for each key metric that relates to success. Further to this, before actually activating and optimizing the first four markets, you should be able to predict how much net cash you will consume as a result of your market expansion strategy. The more aggressive your expansion timeline is, the more cash you’ll consume but the steeper your growth curve should be. And at some point you should reach breakeven at the company level and might be self-sustaining during continued growth. 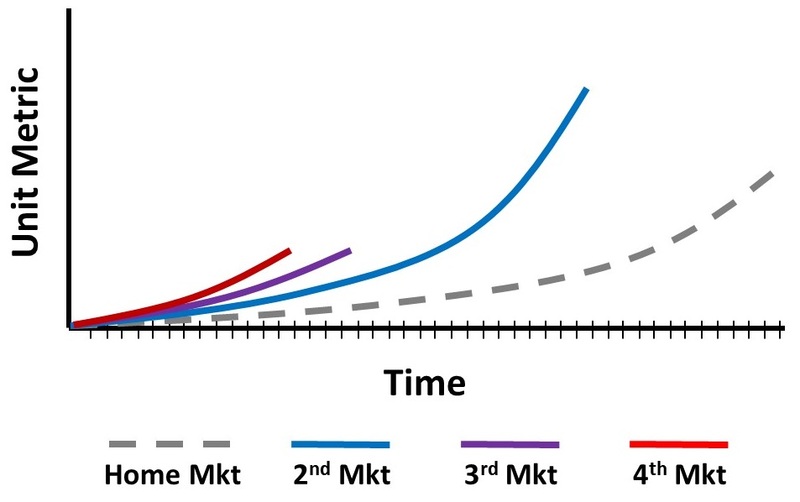 Imaging having a graphic like the one below in your investor presentation, showing the economics of launching a new market every 45 days. In other words, as soon as one market is activated, the next market is launched. You can see that a total of $500K of cash will be consumed from the 5.5 months of activating and reaching operational breakeven for these four markets. But since markets 1, 2 and 3 start generating operational profit during the same period, you would actually burn through something less than $500K on a net basis by the time market 4 reaches operational breakeven. Not only does a model like this help you figure out how rapidly you can launch new markets with a given amount of funding but it demonstrates to the prospective investors and your board of directors that you understand the underlying economics and associated trade-offs. And if a competitor suddenly gets big funding, you could recalibrate your expansion strategy to be more aggressive while knowing how much incremental cash you’ll burn through as a result. Powerful stuff!!! Most of this article has focused on the local resources required for certain types of online marketplaces. But I want to stress the importance of your headquarter operation and related org structure in supporting your market expansion strategy. Many of your programs, processes and tools should be optimized to support your local resources and continued market expansion. Seek out inefficiencies and challenges as reported by your local resources and prioritize various activities to address them. Do this just like you do for your product roadmap by establishing business priorities and mapping the activities to them. Maybe your market activations are going smoothly but ramping up to operational breakeven is taking way too long. To help with the business priority mapping exercise, check out some of the techniques I describe in my article titled “Prioritizing Your Product Roadmap“. All of what has been described above should be manifested into what’s commonly referred to as a “Market Activation Playbook”. It’s essentially your guide or cookbook to identifying, activating and ramping your operations in new geographic markets. Your first playbook will be mostly theoretical and will come from your experiences in your home market. That is the playbook you’ll operate against for your second market and is the playbook you’ll talk to investors about in order to give them confidence that you’re ready to open your second market (assuming you need to raise funding for that). After launching the next few markets, you will surely identify needed improvements and should continue to incorporate them into the playbook until you feel it’s fully optimized (which will never actually happen). Marketplaces that can most efficiently and effectively execute against an optimized playbook for activating and ramping new markets have a significant competitive advantage over their competitors that don’t. In order for online marketplace startups to be viable and successfully raise money, they must demonstrate scalability (see related article titled “The Difference Between Growth and Scalability“). If you’re running a marketplace of the type described in this article, you have an extra burden over most online marketplaces due to the requirement for local resources. As such, you can’t just “shoot from the hip” and take it one day at a time when it comes to market expansion. Be thoughtful and calculated in your approach. I hope you found this article helpful and I wish you success in your journey.